Just a month ago there were still Hydrangeas and Dahlias in vases in my house along with orchids and dried flowers. There is no question you can overdo the Christmas cookies. A queasy stomach and too-tight clothing result from that kind of overindulgence. The downside to an overabundance of plants indoors during the winter in the Midwest? I came home from an orchid show in late October with a collection of plants that are still enchanting me. 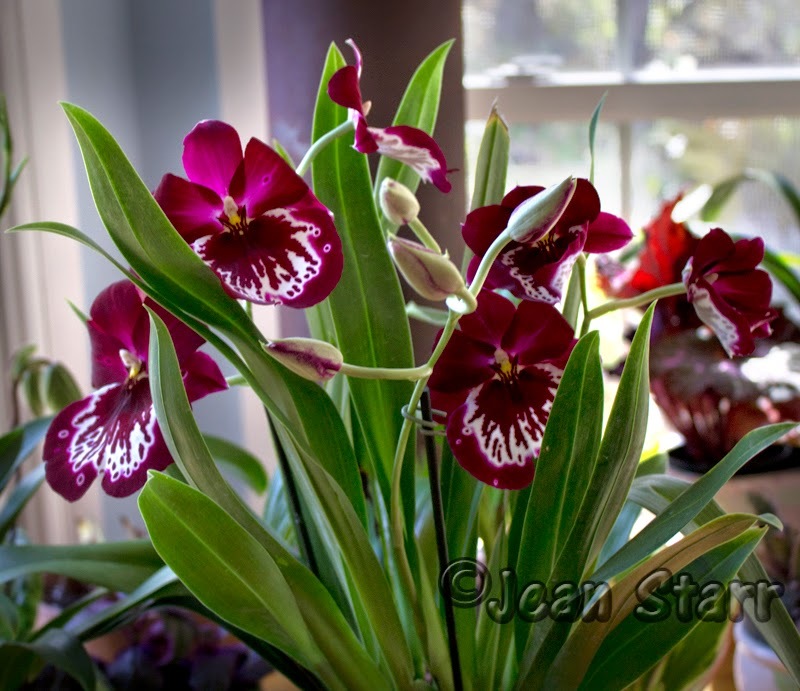 The Miltonia was the first to open, its pansy-like flowers boasting adorable fragrant faces. Today, its few remaining flowers are poised to drop, but a new flower stem is working its way up a set of fresh leaves. Meanwhile, a cute little lady's slipper orchid tantalized me as it maintained a holding pattern as its flowers hovered above gorgeously-mottled foliage. It was the foliage that sold me on the $35 plant. After all, I reasoned, it won't be in bloom all the time. But so far the lady's slipper orchid pretty much as been in bloom since I brought it home. 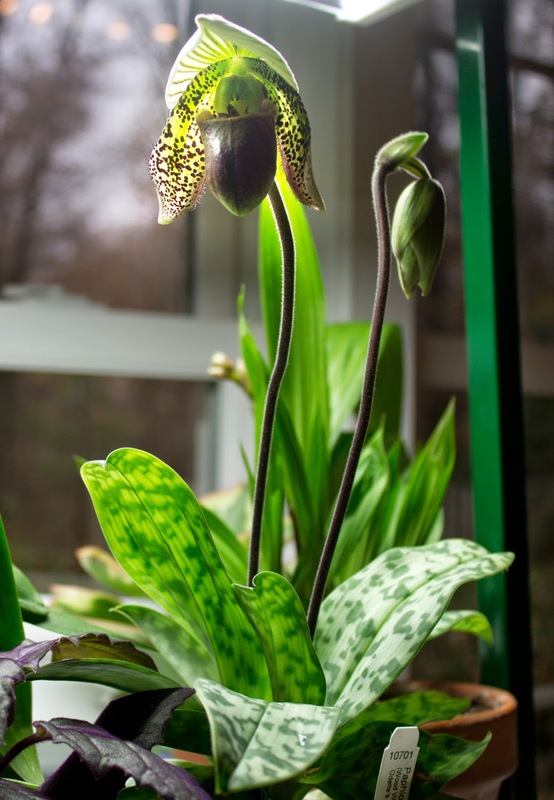 Paphiopedilum 'Delightfully Wood' has a whole lot of exoticism going for it, with its deep burgundy pouch and striped leaves. Paphiopedilum 'Delightfully Wood' Nov. 24. The pouch-like structure on lady's slipper orchids is an aid to pollination--a trap meant to lure insects to the spot where pollination takes place. A great place to learn the details and close-up views of the Paphiopelilum can be found at Microscopy UK. 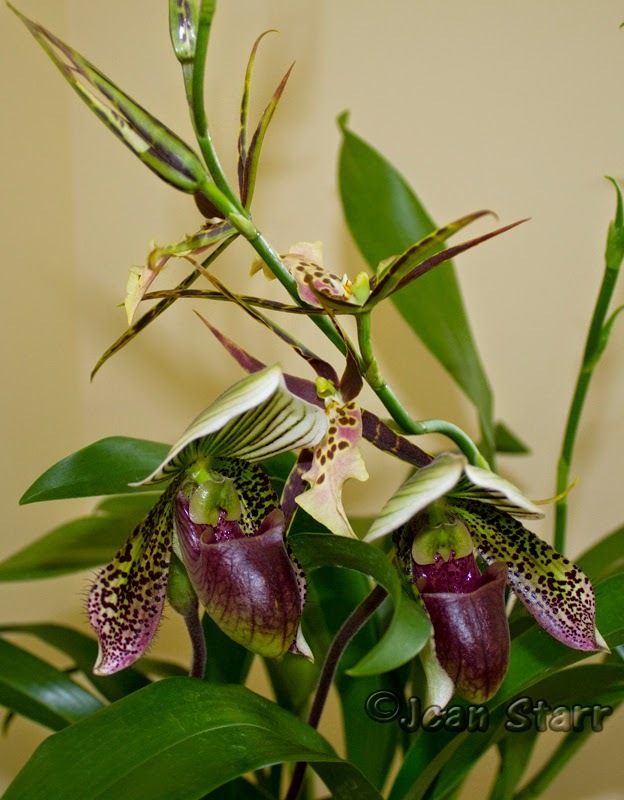 What I also found out on this site is the reason for this orchid's common name. It seems Aphrodite had a surname--several apparently. One of them was Paphia. Combine that with the Greek word pedilon, which means "sandal," and refers to the characteristic pouch of the flower, and you have "Aphrodite's sandal." The foliage of this orchid is one of its best features. 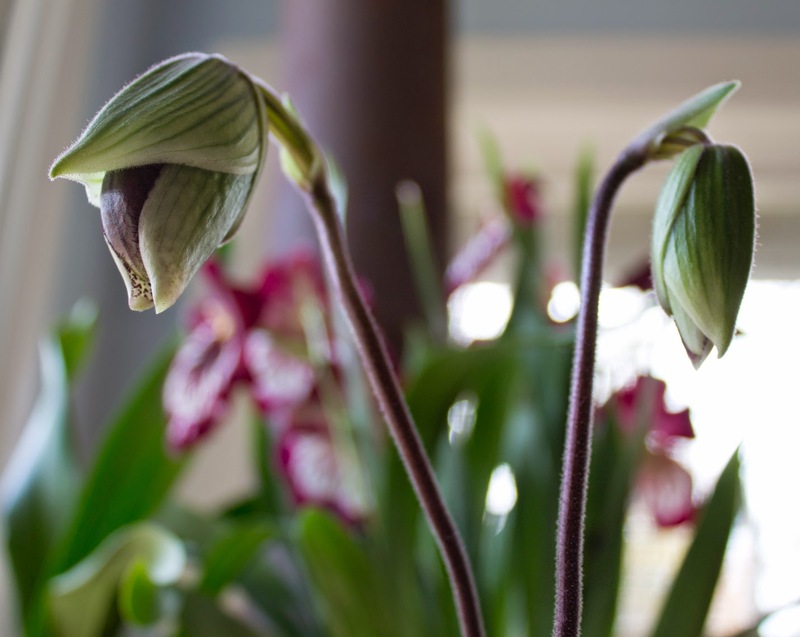 It's easy to see how the name lady's slipper came about as a reference to orchids in the sub-family Cypripediodeae. The colors of 'Delightfully Wood' go beautifully with Miltassia shelob Tolkien, which began to open just a couple of weeks ago. 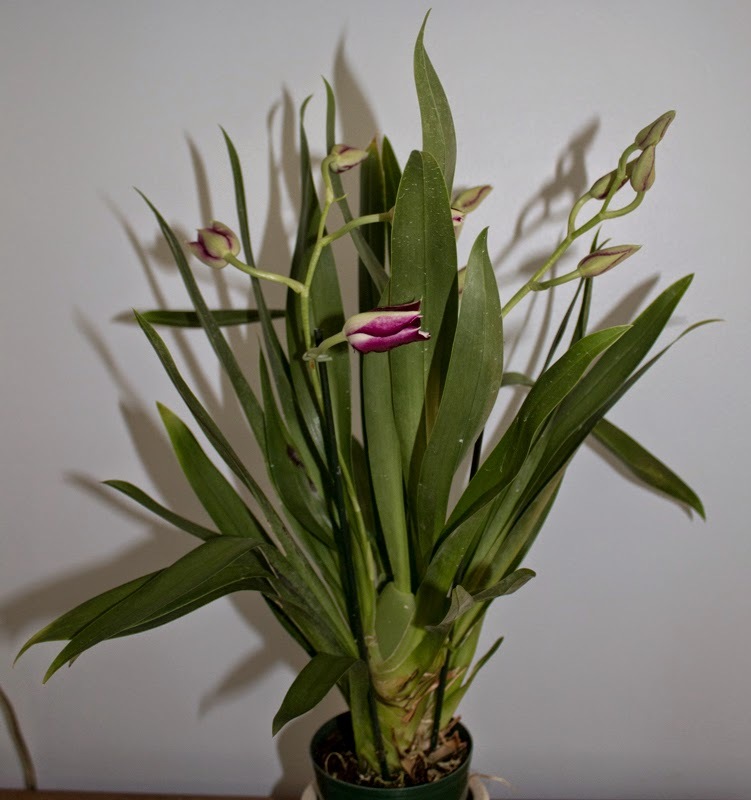 By the time the fourth orchid I bought opens up, the spidery delight will be in full bloom. I'll post on that later in the winter. None of my new orchids scare me as orchids used to. Their reputation for being finicky and difficult to grow might be well-deserved for some of this tribe. But so far, none of the four that followed me home in late October has swooned or failed to thrive. Their flower buds have formed and blossomed, their leaves remain healthy, and in the nearly two months since they've taken up residence, they've added color and a touch of the exotic to an otherwise grey winter world. Surround yourself with living plants. 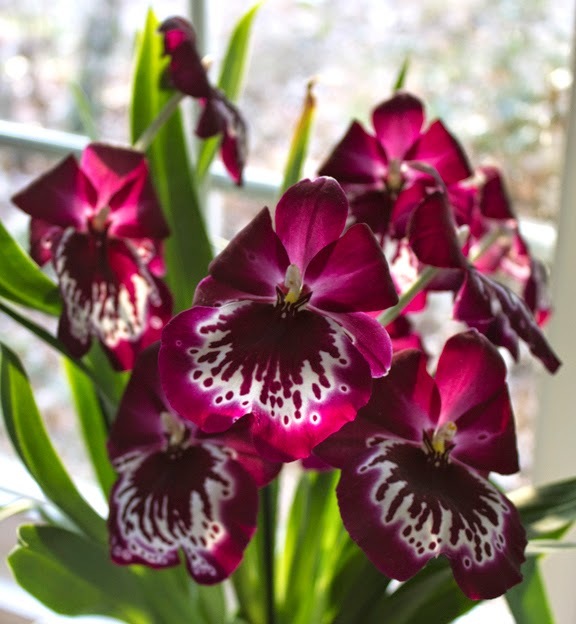 And don't be afraid to try orchids, or anything else you might consider exotic. There is an entire site devoted to growing just about anything. You Can Grow That! is a site overflowing with ideas and inspiration for those who don't stop growing just because it's cold outside.